In a bowl, combine agave, lemon juice and pepper. Stir until dressing thickens. 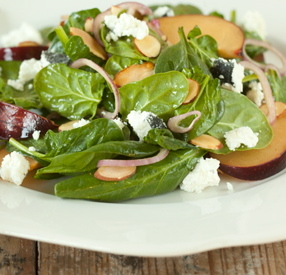 Add spinach, plums, gorgonzola, red onions, walnuts and almonds. Toss until coated. I like your blog and look forward to all the great reads. It has been very helpful.